Create View. View is a HTML template with Knockout bindings, using “data-bind” attributes. It can contain grids, divs, links, forms, buttons, images and other HTML elements for displaying and editing data. Create View Model. View model is a pure-code representation of the data operations on a UI. It can have usual properties and observable properties. An observable property means that when it’s changed in the view model, it will automatically be updated in the UI. Map data from data model to view model. In most cases, data in the data model are independent from UI and don’t have a concept of observables. In this step a map from the data model to the view model should be created. It can be done manually or using Knockout mapping plugin. Bind view model to the view. When view model is initialized, it can be bound to part of the HTML document, or the whole HTML document. Full source code, discussed below, can be found in the Devbridge Public GitHub Examples Repository. Please feel free to check it out and download it. Required functions: search function, navigation function, display folders path, ability to rename a file or folder name within the grid, ability to add new file or folder, ability to delete file or folder with confirmation dialog, display a different icon for a different file type, attach to an Enter and Esc key. ListViewModel. 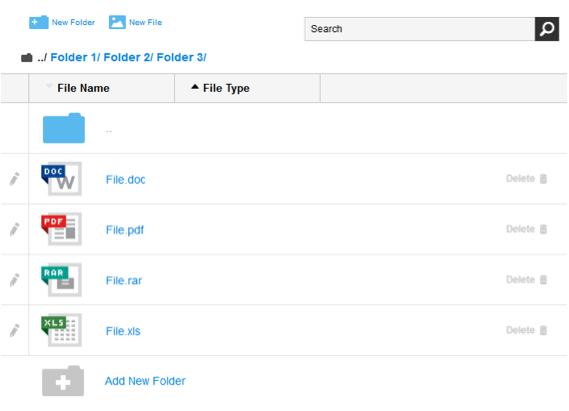 It will contain a list of all the available items, list of visible items (sorted by sort column and filtered by current folder and search query), current path, search and sort fields, and current folder id. ItemViewModel. It will contain a reference to the parent list view model and public properties: id, title, file extension, folder id. It will also contain helper properties, which determine if an item is a file or folder, and if an item is in edit mode. If you want to detect and respond to changes on one object, you’d use observables. If you want to detect and respond to changes of a collection of things, use an observableArray. When new items are added, or when items are removed from array, they automatically appear and disappear in the UI. 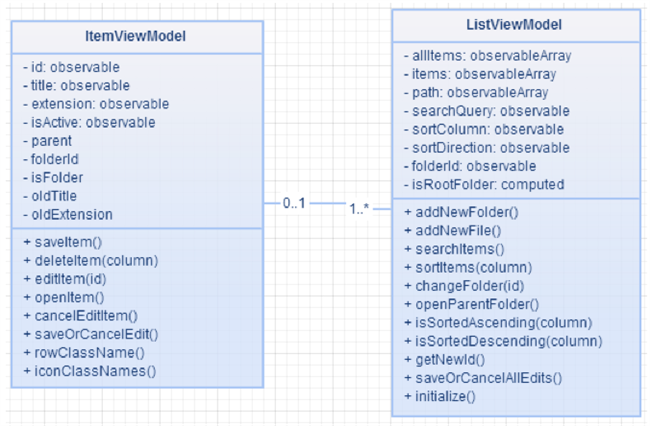 As mentioned before, the best practice is to create a view model with observable properties for each list item. Take a look at Knockout Observable Arrays Documentation for more observable array functions. If two or more view models are bound to the same HTML element, it could cause strange exceptions and some events can duplicate. An HTML attribute data-bind is used to bind a view model to the view. It is a custom Knockout attribute and is reserved for Knockout bindings. The data-bind attribute value consists of two parts: name and value, separated by a colon. Multiple bindings are separated by a comma. All registered bindings can be found in the Knockout documentation page. How to create a custom binding handler we will discuss a little bit later. $index: gets an index of the current iterating item. $parent or $parents: reaches parent view model. $parents, $parents and etc. could be used to reach parent’s parent view model and so on. $root: gets the root view model. In order to add a new folder to the list, we have to add an event handler to a “New Folder” link, so that when a user clicks it, view model’s function addNewFolder() should be invoked. A function to enter into in-line edit mode is very simple – it just sets the observable property isActive value to true. That causes the UI to change the CSS class of the row (as mentioned in the CSS binding example before) and to show edit input fields. NOTE. Do not add parentheses to the binding function when binding to events – it would name a specified function each time the HTML element would be rendered, and would not attach to event. When you have created a computed value you can bind it as a usual observable value. text / html. Used to render text or HTML inside a specified container. For example, in a <div> or <span> tag. When using text binding, text is html-encoded, when using html binding – it is not. For example, if an observable property’s text value is “<span>test</span>”, the binding data-bind=”text: value()” will render “&lt;span&gt;test&lt;/span&gt;” and binding data-bind=”html: value()” will render “test” inside the HTML span tag. NOTE. When an element has bindings to checked and click events for the checkbox (as in the example above) the onClick function must always return true. Otherwise, a checkbox never gets checked as the click event causes it to stop clicking the mouse button event propagation and control never gets checked. options / selectedOptions / optionsValue / optionsText / optionsCaption. Used for HTML drop down (select) element. An options binding is used to pass all available values for the select element. A selectedOptions binding can be used only with the multi-select list - it passes all selected values. For single value dropdowns a value binding will set the selected value. optionsText and optionsValue bindings will tell which passed object’s property contains the text and the value fields. An optionsCaption binding is used to set a caption of the preselected value in the list. When a file or folder is in edit mode, it would be perfect if the Enter and Esc keys would be attached, too. For that, we can create custom bindings, named enterPress and escPress. You can read more about custom bindings, value and binding accessors, and function arguments in the Knockout custom binding documentation. As you can see in the extender example above, target observable value is passed as the first parameter (target) and options is passed as a second parameter (options are not used in the given example). After the extender is registered, a new observable property hasError is created and added to the target. A validation function validate is subscribed to the target value and is named whenever the target value changes. When template is created, it can be used to add template binding and pass a template id to the property name. Also, the template’s data can be passed to the data property. These and other template properties are explained more in the Knockout template binding documentation.